Miquest is UK designed and developed and represents the culmination of 25+ man years experience achieved from working in this specialist field. The system is fully integrated, customisable and easily configurable to address any Asset Management application scalable from single to multi-user and multi-site operations. Miquest has the total flexibility to meet the ever evolving needs of users who require controlling and managing assets and the services that surround them. The system is continuously enhanced and developed on a rolling programme maintaining its leading edge for features, functions and technology. Miquest is a genuine "Future Proof" solution. Miquest automatically tracks asset movements between locations. Assets are marked with either barcodes or RFID tags to produce inventories for each location with analysis of results. Tracks assets as they are moved. Supports Barcode and RFID technologies. Produces accurate movement records and reports. Provides options for managing assets that have changed location. Miquest manages all types of maintenance, reactive and planned, work is triggered by date and or related counter instance. Reactive work is generated from direct report or via the help desk feature. Produces accurate work lists when required. Supports RCM and TPM practices. Schedules work for any timescale and frequency. Includes materials and spares with links to Stock module. Specifies resources and competencies required for each job. Records costs predicted and actual. Miquest is completely scalable to manage any number of sites and buildings and their related assets without limit down to any level of zoning. Links are available to specifications, standards, plans and drawings, documents including condition surveys, occupancy and use categories. Links to specifications and standards including occupancy and use. Provision for reference to plans and drawings. Links to all documents including condition surveys. Options to prioritise and trigger work from a survey result. Miquest is entirely user configurable to address any service management requirement from basic work and billing for goods and services to scheduled and reactive work for multiple sites over any territorial area. Records calls and controls all third party operations. Options for billing goods, services or hire. Manages compliance for service level agreements. Miquest will manage all types of vehicle fleet and hold the details of every vehicle, category, use and drivers, as well as maintenance and running costs. From acquisition to disposal planned or otherwise all data relating to the vehicle is available including; cost, depreciation, warranty, tax and insurances due dates, mileages and tachograph readings. Financial details include acquisition type; lease and costs, purchase and payments/repayments, maintenance and repair costs. Holds all relevant vehicle operational and financial details. Manages repairs and maintenance, spares and fuel consumptions. Reports on vehicle performance and driving patterns. Integrated accident and incident reporting and claims management. 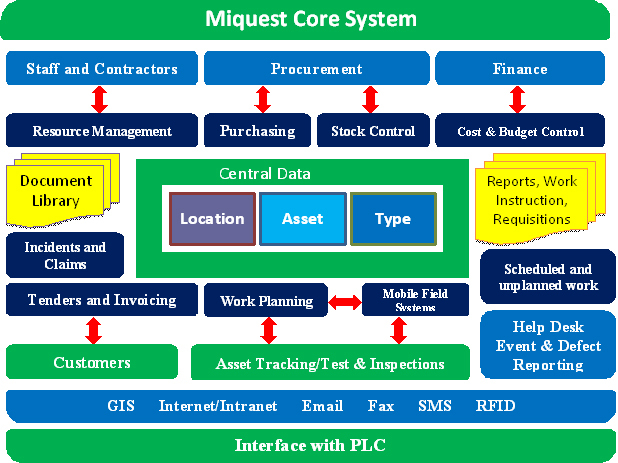 Miquest can hold any level of detail to enable effective management of assets at any location and or type of location. Assets can be sorted and categorised by type and sub type without any limits resulting in maximum flexibility for asset identity and reporting. Visibility of assets and or asset type by location. Multiple search, sort and filter options in all browser lists. Integrated links to all Miquest modules. All hardware resources & appliances. Network, Desktop & Mobile licences. Defect reports & helpdesk requests. Audit trails & user activity reports. Tracks PPE by location or user. Measures item performance and value. Miquest records and manages prevailing hazard and risk information related to locations and assets. Risk statements with version control are linked to all relevant locations and assets. Records risk data and provides version control for updating stored risk statements. Produces relevant work instructions and permits. Highlights hazardous work and or locations. Maintains records of all hazardous work performed and personnel involved. Miquest records any type of incident or accident, such instances can contain as many separate line items without limits, enabling total flexibility for recording any level of detail for any scale of incident. The module limits data entry to information that is relevant only to the defined type of incident making the module intuitive and easy to use. Records any level of detail for any scale of incident. Manages all aspects of a claim. Provides comprehensive reporting for trends and comparison with other incidents. Links to locations and maps. Links to assets where relevant and produces audit history. Miquest provides comprehensive management for all resources. Linking to all main Miquest modules provides effective resource allocation to jobs linked to resource availability, competency and rates. The associated shift module determines a resource availability as well as a record of absences for any reason including holidays and sickness. Allocates resources by skill and availability. Integrates work calendars and shift schedules. Allows for resource and work balancing. Links to IPDS module and training records. Miquest manages stock and purchasing using two linked modules. The operation is flexible as it is recognised that many customers already have existing systems for these functions. Miquest can interface with a customer’s native system and use the relevant Miquest stock or purchasing functionality as may be needed to initiate the interface between the systems. Records all transactions and logs value changes. Supports stock batching, serialisation, LIFO and FIFO practices.